Hi, I have a used pool I got for $200 plus the labor removing it. It is an all aluminum Esther Williams 18 x 33 x 52" with a new in box liner. I have a couple of questions that I would be grateful if you could answer. I'm going to install the liner on foam (over 4" of compacted stay-mat / crusher run which is on undisturbed leveled soil area) with foam coving. Q 1) Can the foam coving go on top of the bottom foam panels, or should the coving be on grade with the bottom foam pieces angle cut to fit the cove angle? I'm thinking of putting the posts and side rails on 8 x 8 metal plates on the stay mat to transfer the post load (which I know isn't large. The pool has straps running under it on the rectangular sides and external gussets. Q 2) Is installing these right on the crushed compacted stay-mat okay, or should I dig out the gravel 2" deep and use patio blocks at all posts and gussets? The pool side wall sheet is 51 1/2" tall, the pool actually measured 52" to outside grade and 50" inside on average (approx 2" of sand over straps, etc). The beaded liner receiver is 1 1/2" tall. So the distance from the bottom of the liner receiver to grade is 50" and probably closer to between 48" or 49" to the sand (or foam) before the coving is built up. Q 3) What depth would this typically be called? Q 4) Where should the liner seam fall? On the coving? Where exactly is best? How critical is this 1/2", 1" ??? - I know liners stretch a bit, but I want to get this right the first time. 56 1/2" long. I may be able to repair them with JB weld, but I'd rather have new if possible. Q 5) Could I purchase similar cross section rails for an 18' round pool and adapt them to repair the corroded portion? 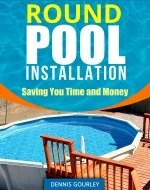 How critical would it be if the pool was installed with a few inches of bottom track missing? Thanks for any help you can give, and feel free to offer any tips that I haven't considered - I'm a good mechanic / electrician but I'm a rookie amateur at this pool stuff. Hi Len. I would use the foam coving on top of your foam base, it's much easier that way. For this application I could get the cove with the sticky back, not the one with the plastic piece that goes into the bottom rail. Your 8 x 8 metal plates would probably work fine for the ends of the pool but I would use patio blocks under the brace assemblies. They need as much support as you can give them. The pool size is probably a 52" but that's hard to say for sure, everything about Esther Williams pools is a little different from the normal above ground pool. The bottom seam should normally lie near the top of the cove. If it were me I think I would open up the new liner and measure from the top to the seam. If you add about an inch to this measurement for a little stretching and a snug fit, that's about the measurement you want the top of the cove to be. The bottom rails may be next to impossible to replace so I would repair them as best possible. Once the pool is up there function becomes less important, especially if you pack the pool in with some dirt on the outside. They do, however, need to be strong enough to allow you to set the wall and finish the pool without the wall moving out of position. Most 18' replacement rails would work on the ends, the arc should be the same. The lengths and size will probably be different so some modification would probably have to be done. All manufacturers make bottom rails a little different. Hope this can get you started and best of luck with the install.